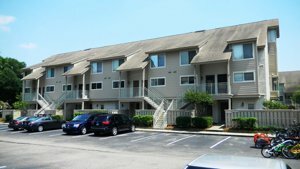 Courtside Villas Hilton Head are maybe the best priced and managed 2- and 3-bedroom condos on the other side of South Forest Beach Drive. The smaller two-bedroom comes in a 1,209 square foot downstairs flat, a 1,246 square foot upstairs townhouse with an extra half-bath under the stairwell or a 1,850 square foot upstairs townhome on either side of the building as an end-unit. 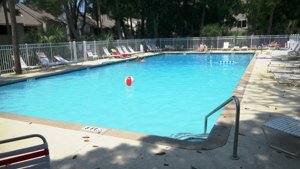 There are two outdoor pools, tennis at Vander Meer next door and just 750 steps to the Atlantic Ocean.